The town of Strabane has much in common with many other towns in Northern Ireland. As you wander through the high street you will see a good selection of familiar high street stores but unlike many towns on the mainland you will also find a good selection of local and independent traders that have been trading here for generations. Like many other towns in the region the centre of Strabane has undergone some major redevelopment in recent years, but despite the new developments and upheaval that they bring with it, has managed to retain some of the traditional aspects of the centre alongside creating some new, modern office and retail developments which look set to bring new life into the area. Despite being a relatively small town there is a surprising amount to see and do here, probably more than you might imagine. If history is your thing there is the ancestral home of President Woodrow Wilson to explore, which is open to visitors throughout the months of July and August, and also following the historical theme, just outside of the town you will find the Gray Printers Museum and Gallery. For the energetic the town boasts an excellent leisure centre and swimming pool. Those looking to carry out a little business here will find that the Alley Arts and Conference Centre has all of the facilities they could need whatever the event. In fact when it comes to modern and contemporary art the town is the site of a rather special sculpture entitled ‘Let the Dance Begin’ which was created in celebration of the diverse attractions, heritage and culture that the town has to offer. 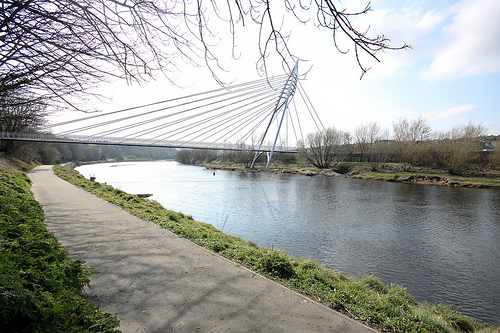 Horse riding, golf and plenty of beautiful walking routes can also be found here and for anglers the River Mourne flows through the heart of the town offering a wealth of opportunities for fishing as well as relaxing by the riverside. Around four miles from the town of Strabane you will find the village of Clady, which is one of the oldest villages in the area. In times past it was the centre for a lot of important trade and early industry as the village is sighted where the original bridging point of the river was, it was also home to a Roman Catholic seminary, the very first one to be established in the region. Another village worth a visit is Sion Mills which although an industrial village is also a designated area of conservation. The village here has a rich architectural history, with the village’s Church of the Good Shepherd being modelled on an ancient church in Pistoia, close to Florence, Italy. The old stone cottages originally built to house the workers at the old mill are still standing, and the river itself, which was once the life blood of the village, powering the mill and transporting all of the goods and trade has become a haven for holiday makers and anglers who come to enjoy life in this rural idyll.